Narration of facts by female voices in an attempt to reduce the gender gap. This was the proposal of a group women working with Mexican Wikimedia that set the stage for what we now know as Editatona, a marathon exclusively for women during which Wikipedia articles on a specific subject are edited, created and improved based on reliable and verifiable sources. This has allowed Editatona to significantly increase female texts on Wikipedia, today’s major online source of information. 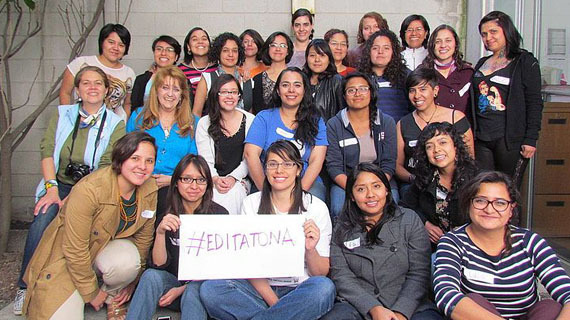 This specific approach to try to reduce the gender gap led Editatona to receive one of the 2018 FRIDA Awards in the Technology and Gender category. Why was Editatona created? What inspired you to bring women’s voices to Wikipedia’s narrative? In 2014 we learned that only one out of ten Wikipedians was a woman, a fact that led us to reflect on how this was affecting the world’s most important online information tool. We discovered that women’s low levels of participation in the edition of Wikipedia affected its numbers —that year, only 16% of biographies available on Wikipedia were those of women— and the quality of the content created suffered, with many articles marked by sexist bias. How would you define the term editatona? How do editatonas contribute to gender equality on Wikipedia? The term editatona (Spanish for women’s editathon) comes from the term used to refer to the collaborative event model which is so popular in the world of technology —hackathon— except that, instead of computer code, participants produce Wikipedia articles. Although Wikipedia editathons have never reached the levels of toxicity or reproduction of sexist behaviors that have occurred in European and American hackathons or LAN parties such as the Campus Party, participants did experience uncomfortable situations caused by men’s behavior towards women, mostly people who only attended to prowl, as well as participants or strangers reproducing behaviors such as mansplainning. Editatona is the feminist response to editathons. Both are marathons for editing and creating Wikipedia articles, but there are fundamental differences among the two: ours are exclusively led and organized by women and always address gender-related topics. In addition to the editing workshop, editatonas also offer workshops on inclusive language and sensitivity and gender equality in writing. Editatona works to build a diverse encyclopedia, one that truly represents the totality of knowledge, with a gender perspective and as a response to the prevailing sexist and gender biased community. Do you believe that the different editions of Editatona have helped increase the number of Wikipedia articles by women and improved their content? In your opinion, have they helped balance the narration? Our work has impacted Wikipedia not only with the creation of articles on topics that did not exist in Wikipedia in Spanish. It has also meant establishing Wikipedia as a space for social action in the fight for women’s rights. When Editatona and other gender initiatives were born within the Wikimedia movement, there were already a few million articles that would be difficult to review in terms of their narrative. Are there any statistics that support the fact that editatonas have increased the narrative balance? How many editions have already been held? How many women editors have joined the initiative? Since 2015, more than 50 editatonas have been organized in the region and this has resulted in the involvement of more than 500 new Wikipedia editors. Editatona has been replicated in Spain, Argentina, Bolivia, Brazil, Chile, Colombia, Costa Rica, Ecuador, Venezuela, Uruguay; even in countries without an organized community of editors and publishers such as Nicaragua and Guatemala. And one of the most significant numbers is the percentage of content on women: more than 19% of the total content is about women (the highest percentage among the five largest Wikipedias). Editatona has managed to weave an international fabric of groups working in different parts of the world. How do you assess the movement’s current dimension? Measuring the impact of gender diversity efforts in the Wikimedia movement is difficult. However, it is clear that changes are happening in terms of participation and the rules needed to create welcoming spaces. Editatona was included on the list of inspiring projects in the Wikimedia Foundation gender equality report in recognition of the work done to increase the number of women editors and reduce the gender gap in Wikimedia content. What drove you to apply to the FRIDA Awards? The early days of Editatona were not easy: it took us a lot of work to “convince” the community (of men) that this was a good idea and we had to put up with disqualifications and ridicule in various spaces. Despite all that, we decided to continue with the project. We always believed that Editatona would continue to grow driven by our sheer “stubbornness.” The first time we were able to organize an editatona with a government institution, we felt very happy because it meant the recognition of our work. We learned about the FRIDA program in 2016, when Mexicoleaks won a FRIDA Award. It was then that we decided it would be a good idea to apply. However, because we knew the high number of projects participating in the program, we never thought our would be selected. Still, we decided to go ahead. And this is the best recognition we have received during these years: it fills us with hope and the desire to move forward. How do you value your participation in this LACNIC initiative? Do you think that the FRIDA Award may help you obtain greater support towards the project’s sustainability and replicability? Today, although more and more technology events and discussion spaces are being created, the participation of women remains very low. We are sure that this type of initiative creates an incentive for other projects working towards the same goal. In addition, the dissemination achieved by the initiative leaves us no doubt that more countries and groups will want to organize editatonas or implement other projects to reduce the gender gap in technology.